With a coastline as extensive and diverse as Scotland’s, it’s not surprising that seafood is so popular here. The process of salting and smoking fish was originally a method of preserving the fish to enable long storage. 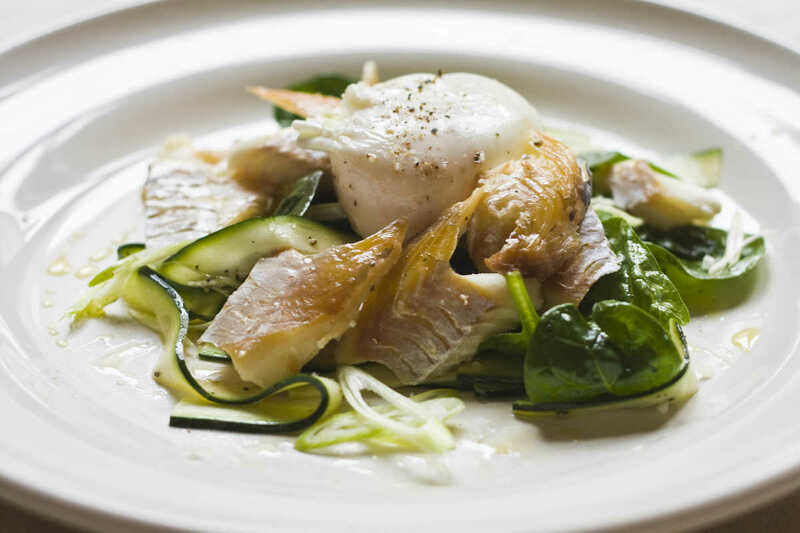 Although not necessary as a means of survival anymore, smoked fish - salmon and haddock in particular - is commonly enjoyed all over the country because it’s simply delicious! I recently had great pleasure in making Cullen Skink - the traditional Scottish soup made with smoked haddock - but since it has been so warm recently I wanted to do something a bit less hearty and filling. Some sort of salad seemed like the best thing to do, so I just warmed the fish gently in some milk, and flaked it over a simple salad of baby spinach, spring onions and courgette sliced thinly into ribbons. Topped finally with a poached egg, simple but delicious. Fill a large pan with water and bring to the boil. Turn down to a barely trembling simmer and leave. Place the smokies in a wide based pan and cover with the milk. Poach gently, not boiling, turning the fish frequently, until just warmed through. Set aside. Thinly slice the onions at an angle, then place in a large mixing bowl along with the spinach. Season with olive oil, salt and pepper and a little squeeze of lemon juice. Cut the courgette into quarters lengthways and cut out the soft pulp from the middle. Carefully cut into long ribbons. Season with sea salt and olive oil, then add to the bowl of salad. Carefully poach the eggs until just cooked. While the eggs are cooking, arrange the salad into 4 bowls. Flake the smoked fish over the top, and finish with the poached eggs, seasoning with a little salt and pepper.